Okay, all you math nerds, today it’s your time to shine because we’re celebrating Pi Day (or Π-Day if you prefer) with a pizza pie party using the fabuloso Dexas Pizza tools! Are you confused? For all of you who struggled with math in school (including me), “Π” is the Greek letter that’s often shortened to 3.14 when you want to find the circumference of a circle. Today is March 14… and so, that’s right, 3/14. Did your eyes glaze over? Back to the Pi Day with Dexas pizza party! My pals at Dexas International have three fantastic kitchen tools that will help make your pizza party a success, whether you’re serving thin crust, Deep Dish style or flatbread pizza! Slide your pizza right out of the oven onto Dexas’ 16”-round polypropylene Pizza Board and carry it to the table with the convenient metal carrying rack. Remember, the board is not oven safe, but it can certainly handle a piping hot pizza! I like this board because it can also double as a serving tray. 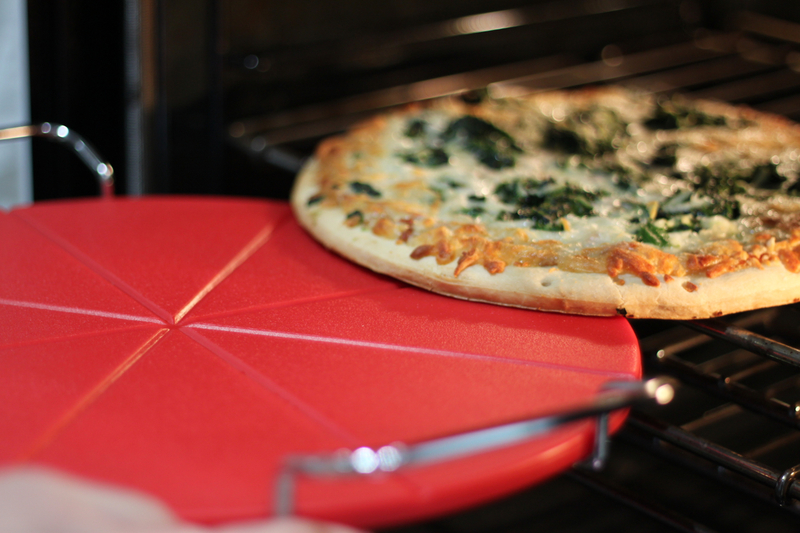 The reversible pizza board has groves to guide you so you’ll always cut a perfect slice. And to get that perfect slice, Dexas has two great options. 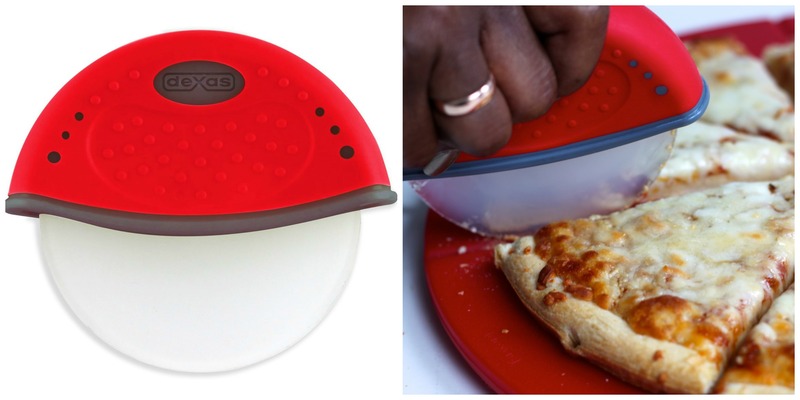 For thin crust pizza, the ergonomic Pizza Cutter Roller lets you apply pressure down on the wheel, so you can navigate your way through all that gooey delicious cheese. The compact roller is easy to control and has a comfortable palm-held grip. I’ve used the Pizza Cutter Roller to cut pastry dough, but it’s also great for flat breads and sandwiches. Here in Chicago, we love our Deep-Dish Style pizza. Dexas has the perfect 15-inch Pizza Cutter Rocker Blade to cut through even the deepest, thickest crust. The polypropylene blade rocks back and forth with just a little bit of pressure on the double handle. 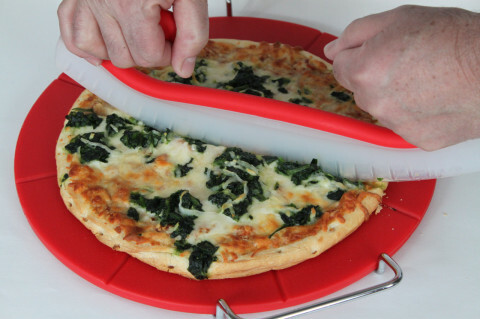 The Pizza Cutter Rocker Blade also works on thin pizza crusts (see the image below!). All of the pizza tools are completely dishwasher safe, too! Every day can be a Pi Day with Dexas Pizza Tools! Sprinkle the yeast into the warm water (105°F to 115°F) and stir gently; let it stand a few minutes. Blend the flour, salt and garlic in a large food processor fitted with the dough blade. Slowly add the water through the feeding tube until a soft dough ball forms. Add small amounts of additional water, if necessary, until a ball forms. Dust a large cutting board with the cornmeal; turn the dough out onto the cornmeal. Gently knead for 5 minutes until dough is smooth and elastic. Coat a large bowl with the olive oil. Place the pizza dough in the bowl, cover with plastic wrap and let rest in a warm, draft free place for 1½ hours. Remove the plastic from the bowl and punch down the dough. Separate the dough into 3 balls. Place one dough ball on an oiled pizza pan, pizza stone or a 15 x 10 x 1 inch cookie sheet. Roll or stretch dough to desired thickness. Spread pasta sauce evenly over dough; sprinkle on cheese and spinach. Bake for 20 minutes or until pizza crust is firm and dry (you can check this by carefully lifting an edge of the pizza with a spatula and touching the bottom). 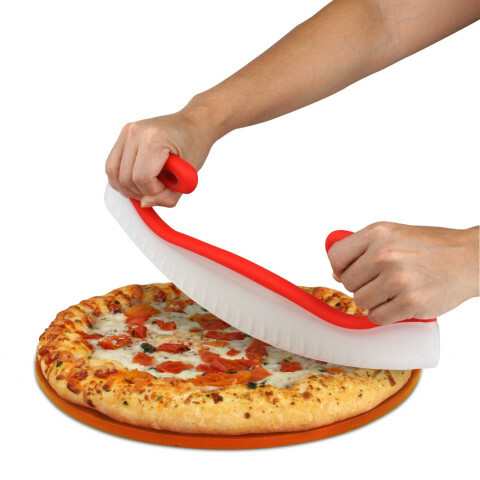 Remove pizza from the oven, sliding it on to the Dexas Pizza Board and cool 5 minutes before cutting with either the Pizza Cutter Roller or the Pizza Cutter Rocker Blade. For a thin, crisp crust: Place the risen dough in the refrigerator for a few hours then roll out or stretch on the pizza pan, pizza stone or cookie sheet. Add the toppings and bake immediately as directed. For a thick crust: Roll out or stretch the dough on the pizza pan, pizza stone or cookie sheet; cover with plastic and let it rise again for about 20 minutes. Add the toppings and bake. For a deep-dish crust: Press dough into an oiled 9-inch round cake pan. Bake at 425°F, 10 minutes or until slightly brown. Remove from oven, add toppings and bake as directed. What a fun gadget! The pizza pie looks terrific – love how healthy it looks with the spinach!